The message for business owners is clear: mobile is the priority. All the way back in January, Google announced that mobile page speed would soon be considered an organic ranking signal. As of last month, it’s official—the longer it takes for your web pages to load on mobile devices, the further your company will fall in the organic search results. Soon after, Google launched the Mobile Landing Page Speed Score within the Google Ads interface. The new tool scores your landing page on a scale from one (extremely slow) to ten (extremely fast). Beyond providing a convenient assessment of page speed, the score is a clear reminder to advertisers that improving user experience (UX) is of the utmost importance. Why? Because in 2018 52 percent of global web traffic has come from mobile devices, and that trend is only going up. Increasingly, from Google’s perspective, mobile UX is becoming synonymous with—well—UX. 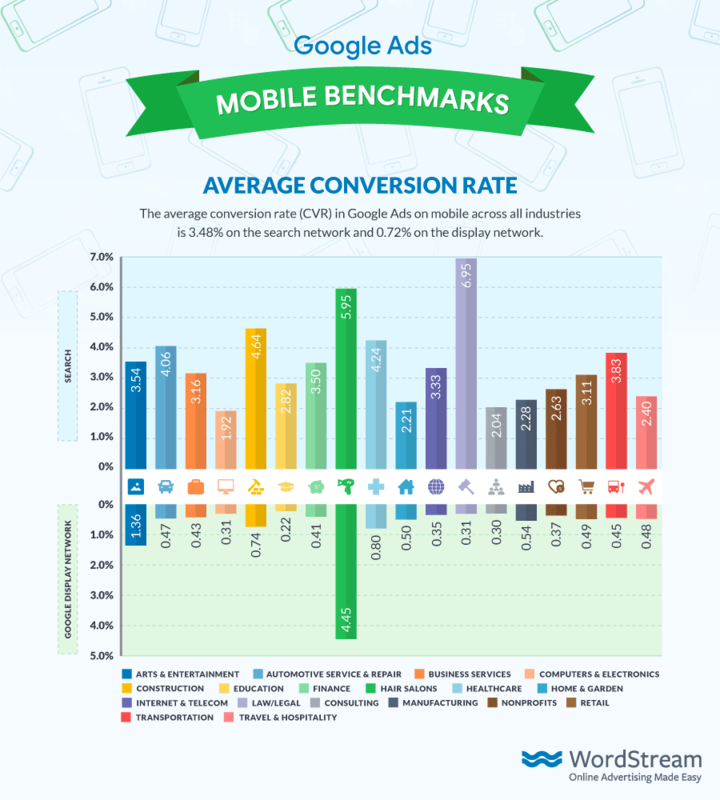 For business owners, it’s never been more important to focus on mobile advertising strategy, in terms of both search and display campaigns. 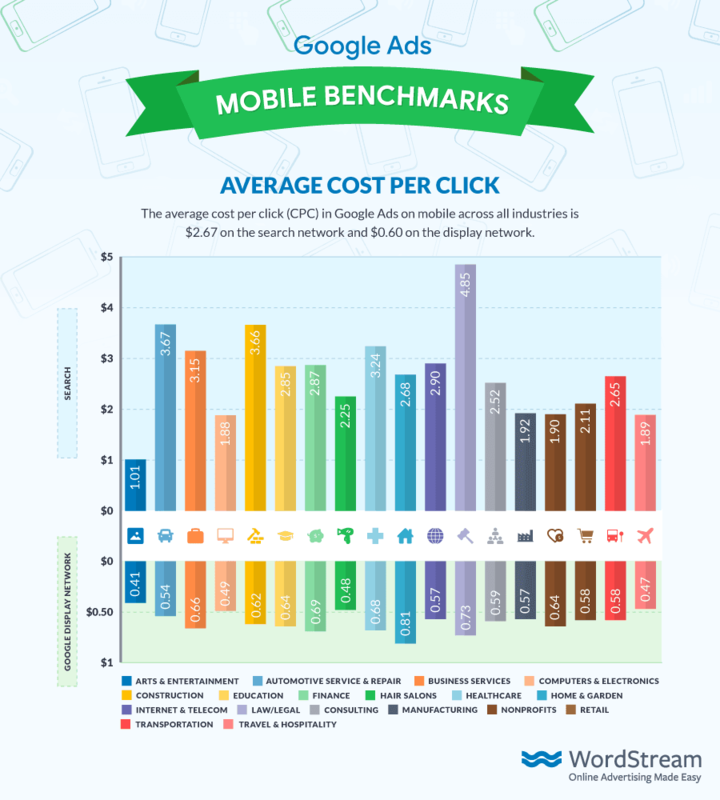 As such, it would be pretty handy to know what you should be aiming for when it comes to mobile performance metrics like click-through rate (CTR) and cost per click (CPC). That’s why we dove into our data. In this article, you’ll find the above averages for businesses in these industries: Arts & Entertainment, Automotive Service & Repair, Business Services, Computer & Electronics, Construction, Consulting, Education, Finance, Hair Salons, Healthcare, Home & Garden, Internet & Telecom, Law/Legal, Manufacturing, Nonprofits, Retail, Transportation, and Travel & Hospitality. When it comes to mobile CTR, Travel & Hospitality lands at the top of the Google search network with an impressive 5.36%. When we originally analyzed the average CTRs of Google advertisers—on both mobile and desktop—we found that those in Travel & Hospitality garnered 4.68%. Evidently, mobile users are particularly inclined to click on search ads for hotels when using their smartphones. Across all industries, the average mobile CTR on the search network is 4.10% and the average mobile CTR on the display network is 0.60%. Unsurprisingly, the Law/Legal industry claims the highest cost per click (CPC) on the search network. This falls in line with our initial investigation of Google Ads benchmarks (mobile plus desktop) and with our analysis of the most expensive keywords in Google Ads (“lawyer” drives bids over 50 bucks). Ostensibly, the tremendous value that comes with acquiring a client for your law practice translates into fairly astronomical keyword bids. On the display network, Travel & Hospitality advertisers enjoy the second lowest average CPC, standing at $0.47. This makes sense, considering how high their CTRs tend to be—higher CTRs yield better Quality Scores and drive lower CPCs. 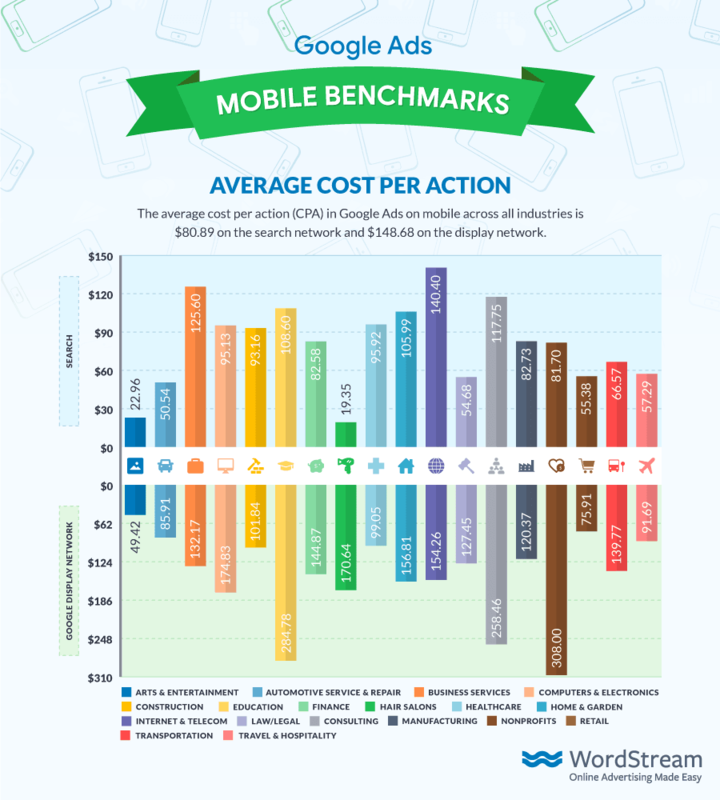 Across all industries, the average mobile CPC on the search network is $2.67 and the average mobile CPC on the display network is $0.60. There’s a lot to touch on here. First and foremost, Hair Salons drive far higher conversion rates (CVRs) on the display network than advertisers in any other industry: 4.45%! Switching gears to the search network, Law/Legal consumers convert at an astronomical rate of 6.95%. So, yes—law firms pay a lot of money per click on their search ads. But, with nearly 7% of those clicks turning into actions, Google Ads is very much a worthwhile investment. At the other end of the spectrum. Education advertisers are struggling a bit. Their display CVR of 0.22% is the absolute lowest, and a search CVR of 2.82% isn’t much to write home about. These subpar metrics, on top of the fact that education sales cycles are excruciatingly long, are pretty indicative of the challenge that comes with education marketing. Across all industries, the average mobile CVR on the search network is 3.48% and the average mobile CVR on the display network is 0.72%. In the same sense that low CTRs correlate with high CPCs, low CVRs correlate with high costs per action (CPAs). If your CVRs come in below the average, you can expect your CPAs to land in the higher half. Massive CPAs for marketers in the Education and Nonprofit sectors likely arise from the fact that their services don’t translate cleanly into banner advertisements. Conversely, Arts & Entertainment marketers have it a little easier when it comes to visual creative. Across all industries, the average mobile CPA on the search network is $80.89 and the average mobile CPA on the display network is $148.68. 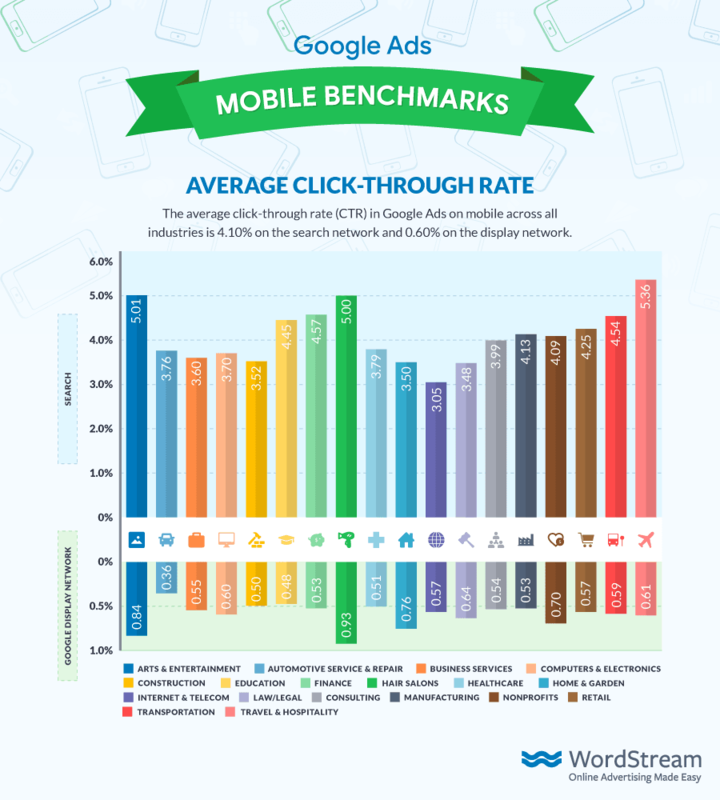 A complete breakdown of how business owners in eighteen major industries perform on mobile in terms of click-through rate, cost per click, conversion rate, and cost per action. If you market a business in any of these sectors, take note—these figures can help inform your online advertising strategies!